Who'll get the Lion's share? In the last week, during a visit to the People’s Republic of China, Singapore’s Defence Minister Ng En Hen has reaffirmed bilateral military ties between the two countries with his Chinese counterpart, Liang Guanglie. Since the Agreement on Defence Exchanges and Security Cooperation was signed in 2008, there have been regular exchanges between the Singapore Armed Forces (SAF) and the People’s Liberation Army, port calls, joint courses, seminars, and a counter-terrorism exercise. But China is not the only suitor trying to woo the Lion City-state. Earlier this month, Mr Ng also met with US Defence Secretary Leon Panetta, with the two agreeing that America could deploy up to four Littoral Combat Ships out of Singapore on a rotational basis, with the first due to arrive in the second quarter of next year. In addition, its Changi naval base was designed from the outset to accommodate ships up to the size of a Nimitz-class aircraft carrier, way beyond the country’s own capabilities. 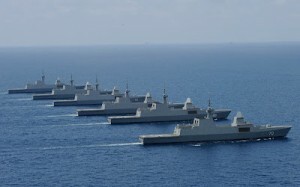 With China becoming increasingly assertive towards its neighbours in the first island chain it see as its sphere of influence, followed by America’s pivot towards Asia in support of its regional allies and the advent of Air-Sea Battle to meet the Chinese threat, Singapore may be forced to choose between its two military partners. Singapore’s Formidable-class stealth frigates – but which side could they end up on? Though Singapore’s military relationship with the US stretches back further, the country has always had an ethnocentric strategic outlook. At the time of its secession from the Federation of Malaysia on 9 August 1965, Singapore only possessed around 1,000 armed servicemen. This and the republic’s small population of approximately four million, prompted Prime Minister Lee Kuan Yew to introduce national service from 14 March 1967. Another major factor behind this was that the majority of those personnel, particularly senior officers, we’re Malay and Indian. With Singapore having a Chinese majority population, and with Malaysia seen as the country’s main threat at the time, Malays were excluded from the draft for its first ten years as Chinese filled out the armed forces’ ranks and were swiftly promoted. Even when Malays were included after 1977, they were assigned to the police and civil defence, not combat roles. The Second Minister for Defence, Lee Hsien Loong, stated in 1987 that “If there is a conflict, if the SAF is called to defend the homeland, we do not want to put any of our soldiers in a difficult position where his emotions for the nation may be in conflict with his religion”. Singapore’s political leaders did not trust Malays to fight against their kith and kin. Should hostilities erupt between the United States and China, can Singapore’s Chinese-dominated armed forces be expected to do the same, and does America need to think more carefully about how far it enters into the Lion’s den? Dr Daniel Owen Spence is Lecturer in Imperial and International History at Sheffield Hallam University, United Kingdom, and publishes on nineteenth and twentieth century maritime history. Singapore certainly has a long and fascinating history. When you say Singapore’s armed forces are “Chinese-dominated,” are you including second-generation and greater ethnic Chinese? I think Singapore plays a better balancing game between the U.S. and China than most understand, but most bet-hedging actions seem guided by a pragmatic outlook rather than ethnic allegiences. In my estimation the best outcome for Singapore’s leaders is of course the status quo (i.e. no conflict), followed by an American victory in a conflict (as the U.S.’ freedom-of-commerce interests are most closely aligned with Singapore’s). The worst scenario for Singapore would be a devastatin and prolonged conflict, followed by a China’s victory and absorption into an expanded Chinese “sphere of influence” that restricted trade. I should caveat: a “long” history by American standards – not perhaps British or Chinese standards.